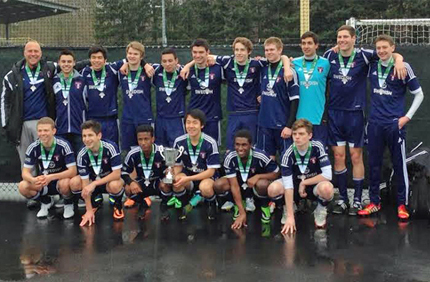 The US Youth Soccer National League kicks off this week, and Mark Kovats' team will be ready. Kovats' Eastside FC 96 Red boys will be making their first appearance in the nation's most prestigious soccer league, which gathers the top-16 teams in each boys and girls U14-U18 age group for two weekends of competition. Four teams per age group advance to the US Youth Soccer National Championships in July, to battle regional champions from throughout the country. The competition is the stiffest that US Youth Soccer has to offer. Kovats, though, says his team -- comprised of 17- and 18-year-old players from Bellevue, Sammamish and other Eastside communities — definitely belongs. Last year, Eastside FC 96 Red won the prestigious Far West Regional League and advanced to semi-finals of the US Youth Soccer Region IV Championships -- losing, interestingly enough, to an LVSA 97 Red team that will also be in this year's National League field. "The bulk of this team has been together for four years, and [while] players have come and gone, the core group has remained strong and committed," Kovats says. "We have been successful at the state level, and have earned our way to to compete at the regional level. Last year, we also won the Far West Regional League - Northwest Division title. All of these successes have helped cement our belief that we can be competitive at the national level, and with the right amount of hard work and luck, anything can happen for us." Kovats says. In addition to LVSA 97 Red, the deep field in Eastside's FC's U18 age group includes seven of the eight teams that competed at last July's US Youth Soccer Championships, including 2014 runner-up FC Dallas 97 Premier (North Texas), 2013 National Champion Smithtown Kickers SC Arsenal (New York-East) and two-time National Champion Fullerton Rangers 96 White (Cal-South), which won in both 2011 and 2012. Also back are both of the division champions from last year's US Youth Soccer National League, in the aforementioned Smithtown Arsenal and Cal-South's FC Golden State White. You can read the National League Boys season preview here. Against such a deep and talented field, Kovats knows that it will take his team's best effort to succeed. "To be successful at this level takes a tremendous amount of focus over 90 minutes, and a willingness to play selflessly, with an understanding that every play we make, big or small, has an affect on the outcome," Kovats says. "We have to be able to deal with adversity and move on from it, celebrate great plays but not be satisfied, and keeping trying to have a positive impact on the game every chance we get. If we can play within ourselves, manage the game properly and capitalize on chances, we have as good a chance as any team involved to be succesful on that stage." Kovats says. For the players, the US Youth Soccer National League serves a second purpose, as well -- showcasing their skills to the hundreds of college coaches expected to attend the three playing weekends, Dec. 11-14 in Wilson, N.C., Dec. 27-29 in Orlando and Mar. 13-15 in Las Vegas. Each team plays on two of the three scheduled weekends. Daniel Strom, whose Eastside FC 94 Red Boys won their National League division in 2011-12, says the National League provided several of his young players with the opportunity be evaluated by, and even commit to, college coaches to whom they may not otherwise have been exposed. "We’ve had a lot of response, a lot of players receiving contacts and being recruited," Strom says. "We’ve had some players commit and it’s a great opportunity and we’re lucky to be a part of it. It’s an important part of what we do as a team." Follow along with all the action throughout the weekend at http://tournaments.usyouthsoccer.org!